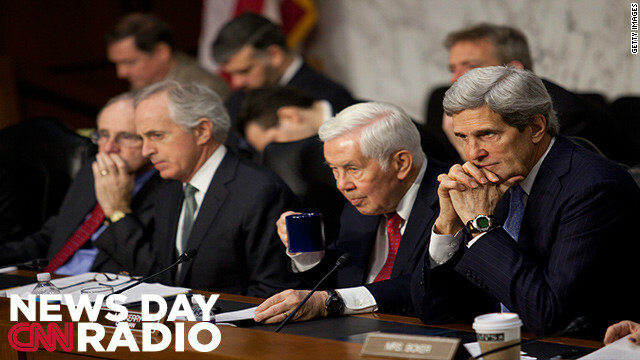 (L-R) Sen. James Risch (R-ID), Sen. Bob Corker (R-TN), Sen. Richard Lugar (R-IN) and Committee Chairman Sen. John Kerry (D-MA) listen to testimony during the Senate Foreign Relations Committee hearing on the September 11th attacks on the U.S. Consulate in Benghazi, on Capitol Hill, December 20, 2012 in Washington, DC.
" ...and there's really not much more you can do with such a scathing report, except eat the crow and call it caviar." "These guys are masters of getting things done at the last-minute." "If a main street retailer is required to collect a sales tax, then an online retailer should be required to collect the same sales tax on the same purchase."